This is the first part of a multi-post series: The 5 Things No One Tells You About Work That Are Critical to Success. There are two employees in the exact same position, Employee A and Employee B. Employee A is extremely productive and flies through the items in their queue for the week. A is the recognized subject matter expert and is the heads-down, get-things-done type worker. Employee B is not as quick at moving items through their queue and does not know the ins and outs of the position like A but B has the presence and the know-how to say the right things in front of the right people at the right time. B is recognized by management and put on the fast-track. A is resentful that B gets so much credit when A is clearly the better person at the job. A likely complains about office politics and favorites when B gets all the glory. It happens in offices across the country and it’s due to the 5% rule. What is the 5% rule? 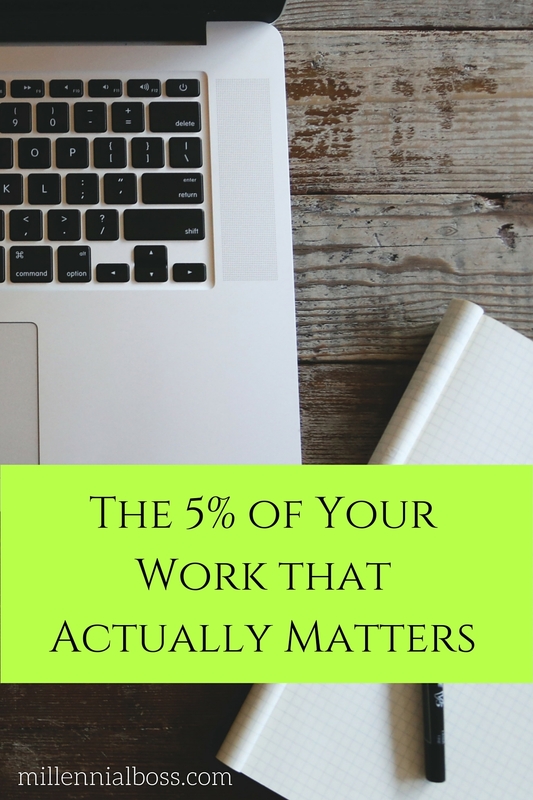 I realized early in my career that 5% of the work I do actually matters. (And when I say matters, I don’t mean matters for the good of society, I mean matters for getting promotions, raises, and so forth). Think about your workload as an iceberg. 5% of the mass is above the surface and the majority is below the surface. No one is sitting behind you at your desk watching your day to day. That work is the 95%. The 5% “above the surface” work is the work that will get you promoted. That is the work that the key decision makers and influencers in your office will recognize and remember. 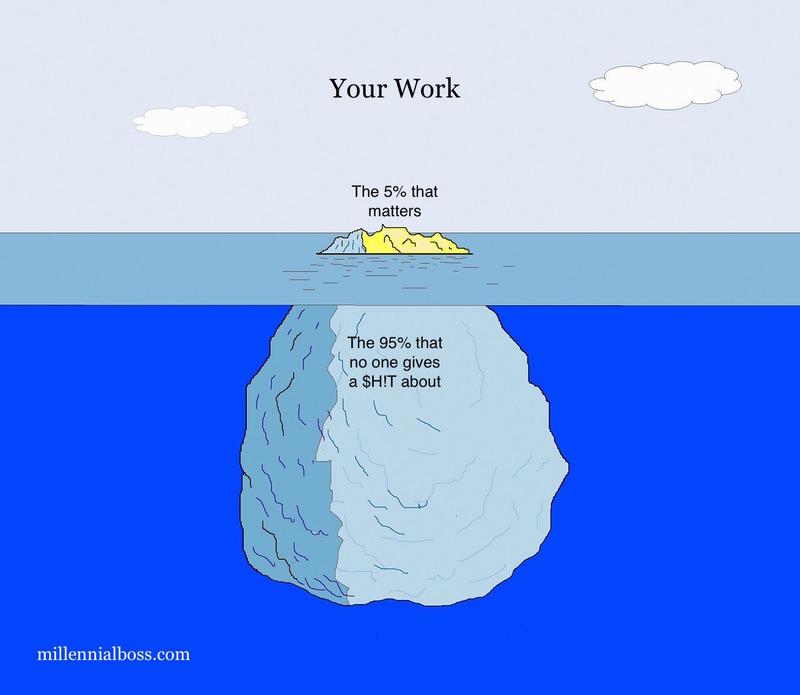 That remaining 95% of work goes unseen. As long as you’re not royally screwing it up, it will have little impact on your career progression. Obviously, being a rockstar in the 5% and the 95% is ideal but don’t neglect that last 5%! The key is figuring out what is in that 5% and creating opportunities for yourself to knock it out of the park. Who are the key decision makers in the office and what is important to them right now? How do I get myself in front of them and show that I am furthering those goals? What are the key relationships I need to build and how can I get those relationships to advocate for me? What does my boss value and how can I create opportunities to demonstrate those qualities or skills in front of my boss? As evident from the questions above, doing the work is not enough. A key component to killing that 5% is gaining office visibility for your work. It doesn’t matter if you’re doing great work if it’s all “below the surface” and no one sees it . If a tree falls in the forest does anyone hear it? Office visibility is something that you go out and create for yourself. It is speaking up in important meetings when you’d rather remain quiet, asking a coworker to lunch when you’d rather just eat at your desk, stopping by your boss’s office to give them an update when you really don’t have to, or volunteering for an important project in a new area when you feel more comfortable taking on the work that you already know. I read somewhere that in the blogging world, you can’t just put words out in the internet and expect readers to come. You have to promote your posts too. The corporate world is the same. Great communication skills are the key to promoting your 5%. If the Eminem lyrics “palms are sweaty, knees weak, arms are heavy. There’s vomit on his sweater already” describe your approach to public speaking than you have some work to do. Employees that have presence and represent their teams well in public settings will be given opportunities to showcase their 5% that others will not. Luckily, there are so many free opportunities to improve on your public speaking skills through groups like Toastmasters or just putting yourself out there and learning through experience. I used to get so nervous speaking in front of groups that I could hear my heart beating out of my chest. When I was in a meeting and we were doing something as simple as going around the room and introducing ourselves, I would freak out before it was my turn to say my name. I didn’t take a Toastmasters course but I did figure out how to calm myself down prior to speaking. I would focus on my breathing, practice what I was going to say ahead of time, speak slower than I wanted to, and basically force myself to do it because I knew it was a great opportunity. When my boss was looking for a volunteer to speak to a few slides, I always raised my hand even when I didn’t want to. Now I love those opportunities. I have a 20 second elevator pitch that I use for those round the table situations. I can give a two sentence sound byte to management so that they can easily understand what is going on, the different options available, and make a decision. I can present well enough that I am given opportunities to represent my team and speak to my work in front of others. That stuff is all my 5%. When I can crush it, in front of the right audience at the right time, I’m moving my career along so much faster than those killing themselves with the 95%. Maybe Employee B has it figured out. Now whenever I hear someone complain about office politics or favorites, I question if they “get” it. The person they are talking about clearly understands the 5% rule and is maximizing their opportunities. Who can fault someone for that? Have you experienced this at work? What’s in your 5%? In my experience, Employee B is also the one taking credit for work others did, is not completely honest with management, and/or is difficult to get along with. That’s not to say he isn’t rocking that 5% and owning all of it – it’s just that my experience says there is more to Employee A’s irritation that Employee B getting ahead for doing less. One thing that has helped me get ahead is being unafraid. If you are always worried about losing your job – trying to say what management wants to hear, for example, you will probably lose your job. Or at the very least, you won’t get promoted. It’s the people who speak up and tell the president of the company “I don’t agree, and here is why…” that get ahead. Luckily I never had to deal with an Employee B who was taking credit. It was more my jealousy that they had the “personality” that everyone loved and no one assessed if they could back it up. Now I realized that if Employee A had the great work AND the personality – then they have the total package! Totally agree. Someone with a rockstar 95% and 5% is the total package! I just was observing how other coworkers I knew seemed to not be as strong in the 95% but were really strong in the visible part of their work and that is all that others seemed to notice! I sort of get this. My situation is a little different, since the rest of the company is in a different state. I’ve actually never met my boss, though I met a couple other employees when they were vacationing here. I’ve wondered for a while now if my efforts shone through. I obviously put a lot more work into my work. The other gal who answers emails tends to be terse and doesn’t modify the pre-written emails (which we don’t always use but are usually enough) in cases where tweaks are needed. I know that my boss appreciates me because I get raises, but I wondered for a few years now if that was just par for the course. I try not to take too much to him because he’s a busy guy. But when I do send things to him, he can usually see the effort I’ve put in (usually several in-depth emails to the customer, only sending it to him when I’m making no headway). So I hoped I was advertising my work without being pushy or putting the other girl down. And believe me, the latter is VERY tempting sometimes. Even though it wasn’t about the money — the company is very generous — it really helped my morale to know that they saw all the extra effort I was putting in. So sometimes it’s about more than money. Either way, though, it’s about making sure your work is noticed. He might not mind if you reached out to him more! That is something I have learned now that I have been both a manager and an individual contributor. I appreciated when my employees would seek me out and provide me with updates – even if the situation didn’t need my intervention or help. Great that you have an opportunity to show him your work through emails though! This post made me smile. Ah, office politics! I’m glad I’ve been out of the office for a few years now or I may have exploded, lol. Haha lucky you! I’m jealous. So true. Never heard “perception is other people’s reality” before but it’s spot on. Thanks – I’ll have to check out your site too! I think you hit the nail on the head! People who advocate for themselves and their achievements get more than those who don’t. Full stop, end of story. Kinda relates to the Pareto principle, right? I’m a head down, work hard type and tooting my own horn is the most unnatural thing in the world. I am fortunate to have had amazing bosses who look out for me and appreciate my contributions. So true! A great boss makes a huge difference! During my first few years, I did it all wrong… Worked hard, kept quiet, and just went about my business… After enough measly 3% merit increases, one starts to question their approach and what they’re doing… I’m not saying it’s right or wrong, but like you said, we have to adapt to the circumstances and do what is best for us… It’s the Game, you can’t really change it… I think for you and me, luckily, we saw early on what was really going on, and knew that we had to jump ship and shop around to the competition to get a fair shake. Know your worth, and learn how to showcase all that in the best light… Something I’m still figuring out how to do in the blogging world! Thanks, Jay!! Appreciate the support! Julie – this advice is gold! I started my career 6 1/2 years ago as an intern and honestly the past two to three years I’ve really started to “get it” when it comes to the 5% rule. In finance this typically is reports that go up to senior management as well as forecast rollforwards and telling the “story.” I always put in the extra effort to make sure my work is as polished as possible around forecast and earnings time. It’s definitely the 5%. The rest of the equation, in my opinion, is making sure that the 95% doesn’t get left undone or fall through the cracks – because then something can become visible that should be in the background!